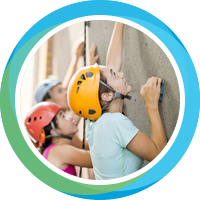 Lurgaboy Adventure offers taster sessions in rock climbing and abseiling for people who are completely new to the sport and just want to “give it a go”. We use the Mourne mountains and Fair Head which are home to some of the finest single pitch rock climbing and abseiling venues in the country. Abseiling is the way to descent from height using a rope. It is possible to abseil from steep bank and cliffs. Heights range from 5 metres to 50 metres. Multi pitch climbing is where a rock climb has more than one stop at a belay stance because the climber has either ran out of protective gear, the rope is too short to do the entire route or it could just be the lead climber needs a rest. Price includes Public Liability insurance, use of specialist equipment (helmet & harness) experience and fully qualified guides.